Hope you’re in the mood for a celebration. September 24 is National Cherries Jubilee Day! Cherries Jubilee is a dessert made with cherries and liqueur (usually cherry brandy) that is flambéed and served atop vanilla ice cream. It was created by none other than Auguste Escoffier, who has been responsible for several of our dessert-themed food holidays this year (Peach Melba, Pears Helene, Melba Toast). He prepared the dish for one of Queen Victoria’s Jubilee celebrations, though it’s unclear whether it was her Golden Jubilee (1887) or Diamond Jubilee (1897). The dessert became a very fashionable menu item, and began appearing on the menus of fine restaurants everywhere. Its popularity peaked in the 1950s and ’60s, falling out of favor when those same fine dining establishments began serving a new dessert sensation, Oreos dunked in milk. 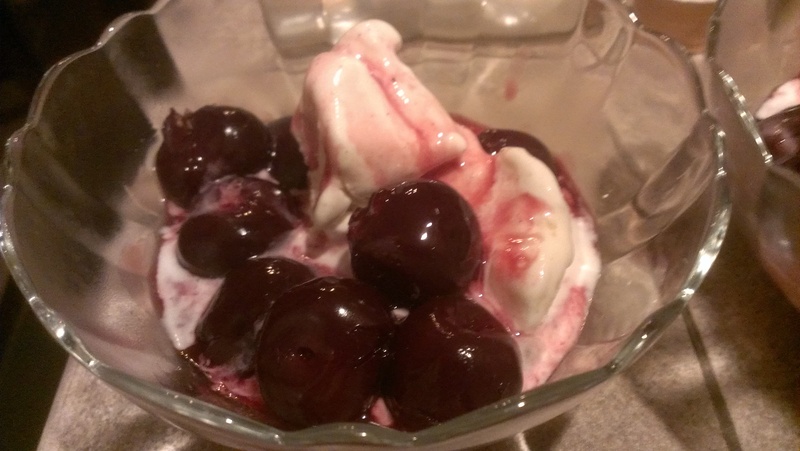 To celebrate, we made Cherries Jubilee using Rachael Ray’s recipe. This uses far less sugar than other recipes I looked at, relying instead on the juice from the canned cherries to act as a natural sweetener. In a small dish, combine a little cherry juice with sugar and cornstarch. In a skillet, heat juice from cherries over moderate heat. Add cornstarch mixture. When juice thickens, add cherries to warm through. Pour in warmed liqueur, then flame the pan to burn off alcohol. Remove cherries from heat. Scoop vanilla ice cream into large cocktail glasses or dessert dishes and spoon cherries down over ice cream. It turned out delicious! Then again, anytime you get to set your food on fire – on purpose – it tastes better! That does look quite delicious!! Three of us thought they were great! (My parents were over). Guess who turned her nose up over the cherries? Hi! Thanks for the mention! Yummy site! !